Nicola Gess is a professor of German Literature at Universität Basel. She received her Ph.D. from Princeton University and Humboldt Universität zu Berlin in 2004 and her Habilitation from Freie Universität Berlin in 2012. She is the author of two monographs: Gewalt der Musik: Literatur und Musikkritik um 1800 (2011 in 2nd edition), Primitives Denken: Wilde, Kinder und Wahnsinnige in der literarischen Moderne (Müller, Musil, Benn, Benjamin) (2013) and is currently finishing her third monograph Staunen: Eine Poetik to be published by Wallstein in the fall of 2018. One of her new research fields is the study of half-truths: How are they constructed, how do they work, why are they so successful, and how do they spread? 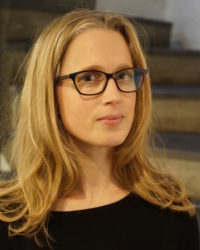 In this context, she is also directing collaborative research on the use of half-truths in conspiracy theories, focussing mainly on contemporary German contexts and looking at actors (such als publishing houses) and their networks, non-fiction and fiction books, as well as on the formation and distribution of conspiracy theories in right-wing populist groups in social networks.